Wondering what makes the difference? It’s worth finding out, because of the huge income increase writers can see promoting themselves as a content marketing strategist, rather than simply a blogger. Do you toss off blog posts about whatever strikes your fancy? Content marketers don’t do that. They begin their writing process with keyword research on their topic, to find out what phrases are both popular and relatively easy to rank for. Do you know what the top blogs in your space published this week? Content marketing depends on having this intel, so you can position your blog (or case study, or white paper, or infographic) to mine similar territory in new — ideally, even more useful — ways. Content marketing relies on relationships with other influential bloggers. Smart content marketers get out and start building connections, long before they need to ask for an interview or a retweet from a top influencer. By contrast, amateur bloggers reach out with emails that essentially say, “Hey total stranger, would you do me a favor?” And then wonder why they don’t get any shares. If you don’t have a tool like Yoast SEO that helps you improve the SEO of your post, you’re pretty much wasting your time writing the post. Think about how many posts come out each day that you’re competing with! You’ve got to help Google realize what yours is about, or you’re never going to get the readers you want. Most bloggers write a post, press ‘publish,’ and figure their job is done. Maybe they tweet it out once. For content marketers, creating the post is just the beginning. It’s the ‘content’ half of content marketing. Next, the marketing half begins…and goes on. And on. That’s a company re-sharing its own content over and over. Anybody can understand why that would make sense. But more sophisticated content marketers take it a step further. Content marketers fire up their scheduling tools (I like HootSuite), plug good content in, and schedule it out for weeks at a time. This means that when they have stuff of their own they want to promote, they have a deck of other good stuff to sprinkle it into, so they don’t seem too salesy and self-promotional. Also, repeatedly sharing others’ content is a terrific relationship-builder. I now happily follow and share Sam’s content, right back at him. Ever sit down before you write a post and think about how easy or hard your topic would be to promote? Content marketers do. They engineer their posts so it’ll be fairly easy to get tons of shares. Do you know what you’ll be publishing on your blog a month from now? Content marketing strategists do. They know what they’ll be selling months from now, and are busy devising complementary content that will drive the right sort of readers. This is a time-honored strategy that began with complementary copy in magazines, where an article about how to put on makeup is always sitting right next to that Maybelline ad. I’ll just say the last time I was out guest posting to promote a new e-book, some of the top blogs I contacted let me know they were booked out about three months. Content marketers plan ahead! Do readers know what to do at the end of reading your blog post? Content marketing involves creating content that’s released in service of getting readers to take a particular action. That call to action (CTA) moves readers along the road to being buyers. One final note on this — the days when “sign up for posts!” worked as a CTA are long gone. Create a useful freebie if you hope to build a list. I wish I had a dime for every blogger I’ve met who says they hate Twitter, or plan to get into using social media some day, but just never seem to have time. Social media is one of the primary content-marketing tools. I’d say these days, I’m recruited to write in part because I have a decent-sized Twitter following. Being a content marketer means showing you can offer more than just good writing — you’re a total package of good writing and promotional savvy. Stop thinking it’s too late, or too hard to get many followers, and get started in social media. Connect with popular bloggers who already have a big social-media audience, and you may be able to build up pretty quickly. Every day you wait is a day longer it’ll be until you have enough followers to move the needle on clicks. Want to learn more about how to get great-paying content marketing gigs? Join me tomorrow at a free training. My distinction between content marketing and blogging is when blogging the writer is telling a personal story and taking the readers on a journey. With content marketing the writers are doing the same thing, but with an end goal to get you in front of a product, connect with it and believe it can solve a problem of yours. Authentic content marketing needs to increase in my humble opinion. Nice insight, Big League — just a warning that I don’t usually allow comments unless you have a person’s name — please use one next time, so we can get to know you! My mistake! I’ll make sure to use my name from now on. Happy Holidays! I really enjoyed this read! I sometimes see these terms used interchangeably; you clearly laid out all the differences to avoid any confusion. I don’t know how some bloggers make it without social media! This is an outstanding breakdown of content marketing. I think it’s important for freelance writers to understanding the fundamentals and help explain those to their clients. I think too many people don’t understand the specificity and strategy that goes to content marketing and this post should be used as an absolute starting point in the discussion! Thanks, David. My point is that by taking the discussion to this more sophisticated level, writers can position themselves to earn a lot more. And the content marketing side is probably stuff most paid bloggers KNOW — they’re just not presenting themselves as someone who has the knowledge to plan their posts as part of a marketing agenda. And that makes all the difference. This was an interesting topic and enjoyed reading this post. I believe that serious, passionate, consistent and professional blogging is basically called content marketing, when there is a marketing to distribute and amplify the blog post to the larger audience using different online channels. But content marketing can be of many different forms, starting from articles, videos, info-graphics, podcasts, case studies etc. where as blogging is basically publishing articles (in general). I’m not sure you read the post, Sonia. Simply writing blog posts and retweeting them, to me, is blogging. You can ‘call’ it content marketing, and maybe it is that, but it’s not EFFECTIVE content marketing, usually. Having a strategy, a goal, and an intentional content development and promotion plan is what adds up to content marketing — and is the level of activity that allows you to position yourself to earn more as a content marketing strategist, as a freelancer, rather than simply pitching to write blog posts. I don’t think simply throwing in a video or infographic turns it into content marketing. It’s more about the intent, planning, SEO focus, and strategy behind it than the form of content. I would add one quote from John Wooden in this discussion. before it’s not there anymore. Thanks again Carol – such fantastic info! Hey, it’s a writeoff! And what other options do you have, than to have stable, viable Internet to do business online? I don’t even think about the basic costs I have running this blog and the Den, at this point. They’re just what’s needed to make this all possible. Businesses have expenses. Folks just have a myth in their heads that blogging should be free…but successful blogging usually involves investing in some resources. You’re so right – what’s the price of a stable business? I’ve been practicing false economy and it’s cost me. Thanks for the wake-up call! Ooh, love that! False Economy. That’s it exactly! Really common affliction among bloggers. One of the things I notice is that the term ‘blogger’ can come across as a personal hobby rather than as a serious job. On numerous occasions, people have asked me what I do and I say, I”m a writer. I then go on to explain that I write online. This statement is followed by a sudden lapse in their interest and respect. “So you like, blog?”, they say. “Can you make money doing that?”, they ask. However,as a Content Strategist (or Marketer), I am sure people’s interest and respect will be easily commanded. Why? Because you aren’t just a “blogger” talking to yourself. You take the job seriously. You become a business. Much like a personal trainer who incorporates diet, lifestyle and analytical recordings to assist their client, you become the real deal by marketing your work effectively, building solid relationships, utilizing tools, and learning to optimize your articles for SEO. Hello, that was really useful, I now understand that how important marketing is to get readers to your post. And most of all learned many new things about marketing from this post. Great info, Carol. Thanks. Missed the webinar. Looking forward to the replay. Also, I have a question: How do authors who comment on the blog posts on your site, sometimes have this at the end of their comments: ‘their name, recently published…’ and a link to their article? Like in the comment posting section, there’s only a space for a website link, so how do they link their articles with that specific line? It’s a tool called CommentLuv, Susie. I used to have it here on the blog, but it broke a while back, and we decided to leave it off. I don’t believe it’s working anymore — correct me if I’m wrong! You’re probably seeing it on older posts. Anyway, it’s a decision the site makes, whether to offer a tool like that, which gives commenters an opportunity to promote a post of theirs. If they have it, and you have a blog and have entered your blog URL as your site in the comment form, then it pulls your most recent post (or with premium versions of the tool, may give you a choice of many recent posts you might want to feature). It was a critical tool to have years back, but at this point a potential negative with Google, and so many posters were coming on JUST to use that tool and leave a link, and leaving non-relevant comments that didn’t advance the conversation. So we decided to remove it. Hope that answers! Carol, I appreciate the way this post condenses all the vague learning I’ve been doing into a clear list of action items. Shifting gears from a personal blog to a business blog myself, I needed the clarity your post provides. My biggest challenge is making time to do that vital keyword research and the tracking of results. Thanks for holding my feet to the fire. I blog to take a break from writing content. One of my blogs does quite well. The other doesn’t. I don’t mind. I like to express my feelings about things. That’s not to say you’re not right. If you’re blogging with a view to making money, your blog has to be found and your posts have to be compelling. As always, Carol, you teach us the best tips. Thank you for the Den I was swallowed up by an editor position and now I’m back and ready to dig in! 🙂 Annnd…I’m building a new website so I will link it when it’s built. I think I’m headed in the right direction: looking forward to Tuesday’s workshop. Hopefully it will also talk a bit about how to sell prospects on the value of content writing. I still run up against a lot of potential clients who hardly know ANYTHING about well-planned use of content: they just want “a blog” because everyone else seems to have one, and often they’ve already made some attempt at writing the whole thing themselves and found it a lot of work for no results. Small wonder that their primary concern is still “Will this cost me much?”–and, I confess, I’ve been short on persuasive “this is a priceless business asset” answers, mostly because I haven’t gotten that far beyond “I do this because I love to WRITE” thinking myself. Those aren’t content marketing clients, Katherine — as this post notes, they’re ‘just blogging.’ One of the big differences we’ll be talking about. You’re looking for clients who get content marketing and have developed a strategy, or who want to up their game and get to this level. This was such a good overview of the whole concept of content marketing. The more I learn about content marketing the more I find it quite fascinating. Coming from a PR background originally (and before that, journalism) I see a lot of similarities between the two – I like that ‘content marketing’ has such as strong focus on relationship building and strategy based on research. Will tomorrow’s webinar be recorded for Den members? Thanks :-). I’ll look out for the replay there. Have a great day! Carol, you say to hire the tech help. Where would you recommend looking for tech help? Upwork/Freelancer, et al? Elsewhere? Thanks! Since I don’t hire overseas myself just on principle, I tend to look in my network. When people are touching my blog, I like them to live in my neighborhood. Your local high school or community college digital design instructor can be a great source of referrals to low-cost help — that’s actually how I got my first writer website set up, with a high schooler. Thanks for a very helpful post. Lots of new info here for me. Another great practical post, Carol. I read them all. Guess I need to take a look at Twitter! I have been slowly working on my business FB page and LinkedIn. I was trying not to spread myself too thin while I worked on one venue at a time. I need this upcoming class! Thanks! Business FB for freelance writers, I’ve never heard is something effective. But if you’re blogging, Twitter is generally the #1 place for promotion. 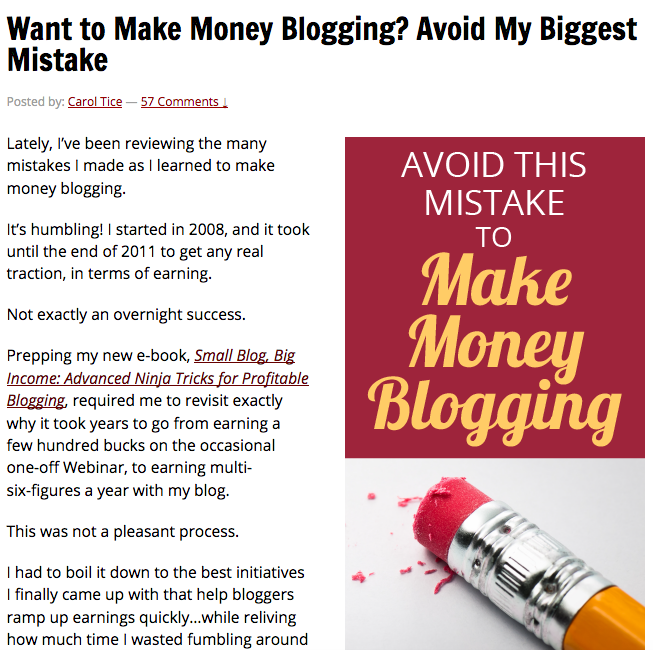 I used to get SO much traffic from there on my Forbes posts it was amazing. What a difference between the two types of writers! I’m looking forward to the training tomorrow. You can see that it’s really worth learning a few more skills, hm? I’ve coached SO many writers who’re earning ridiculously low rates for blogging. And this is the answer. Know more about the POINT of blogging — learn content marketing so you can take a bigger role in helping a company make more sales. Awesome and inspiring, Carol! Hope to catch up with you. Will there be replay? Thanks so much! Thanks Carol, for all your helpful insights into the world of freelance writing. I’m a bit of a technophobe but with your help I can improve my chances of writing for a living. If you’re a technophobe — hire someone to do that side of it. Really, you can. FYI you typed in your website link wrong and it failed. Classic! But you’ll get the hang of this. Thanks Carol. I freelanced for a long time, have worked for a company for a while, and am headed back to freelance land, happily. Your tips inspire me and set my feet on a path to work that will actually result in more work and paying clients. I appreciate it. I’ve been reading your posts off and on for a few months, but as I get serious about starting my freelance career, I’m getting more regular about checking this site. Firstly, this post was hugely helpful in my understanding of the difference between these ideas. Secondly, it is SO ENCOURAGING to see that it took you literally years to gain “traction” as you said. It is a bit scary to think how long it might take me, but knowing I’m not alone is the biggest comfort. I’m a fulltime freelance writer who made the jump from toying with blogging to fulltime freelance writing in a just a month and was making ~$800 / week right out of the gate. The key is to find the right customers. There are many opportunities, but as everything relating to our world today, information overload and the confusing sources of information make it hard to really know what is the right path. I appreciate those who share. Thanks for such an informative post!! It has so much info, and you give it all for free. I only just started reading your blog, but it’s been very, very useful for me already. Every single post I read has been really helpful. You’re welcome, Brandi! Just trying to be highly useful. I consider it a privilege to have so many readers and subscribers, and believe they deserve valuable info they won’t find elsewhere here on my blog.